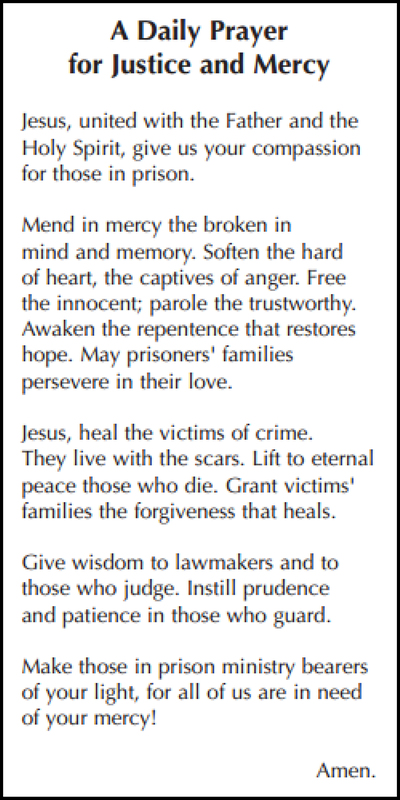 We invite all people—including prisoners, victims, families, law enforcement personnel, those in the justice system, and all those touched by the violence of crime—to join in the Prayer Campaign for Justice and Mercy. Simply say the prayer below each day, asking the God of Justice and Mercy to touch your heart and the hearts of all those touched by crime. The prayer is available for download below in both English and Spanish. We encourage people to make copies of the prayer for distribution in prisons, parishes, schools, justice groups, nursing homes, etc. You can also ask your pastor to include it in the parish bulletin, share it on the parish website, or make copies available in the church. We currently send it to prison chaplains in the prisons we serve.